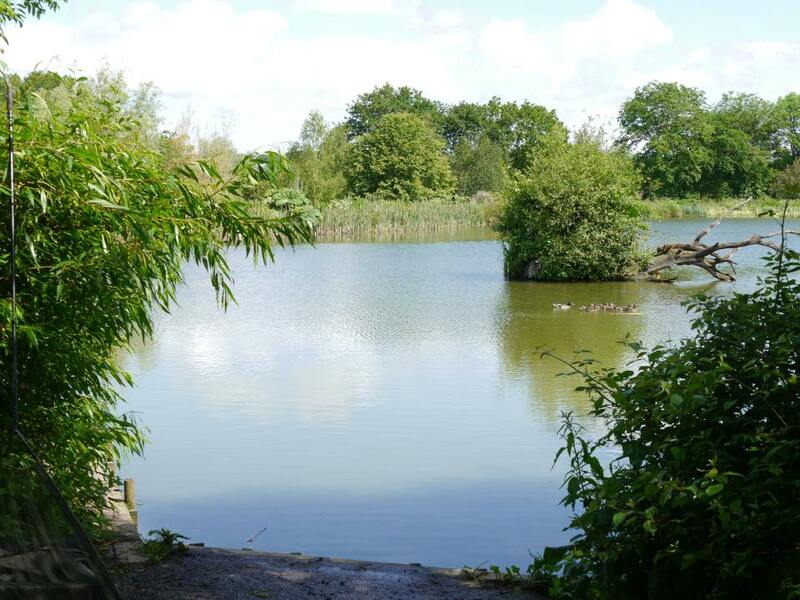 This Carp lake was built in 2006 and was stocked in 2007, it contains 100 fish ranging up to and over 46lb with some 30 fish over 30lb & 60 + over 20lb. The lake varies in depth between 1.5ft and 12ft with an average of 3.5ft to 4.5ft. There are reeds all around the lake providing plenty of features to fish to. Each Carp Fishing Swim on the lake offers the angler some thing different to fish to... The Specimen Carp Day Ticket Carp lake was built with only one thing in mind, to offer the Carp Angler a high quality carp fishing venue with some of the most beautiful carp in the southwest of England to fish for. The Island lake has eight swims all offering the budding Carp Angler features and hot spots to temp these stunning carp from.. Swim 1 is in the north east corner of the lake, it is a small swim but can be very productive especially when the prevailing south westerly wind is blowing, drawing the carp down the lake into this food rich corner of the lake. This swim offers a lake margin, weed and lily pads to fish to.. This is now a double swim and there is slightly deeper water out in front of this swim off the far margin, and a sunken island and bar to the left. Also there are several snags in this swim which sit on the island and bar to hold the fish. Again you can fish back into the old swim 3. As the name suggests this is where one of the main springs comes into the lake, which offers the carp in the lake a good level of oxygenated water. This is a great little swim with the main snag island in front of you and bars going left and right. This is a cracking swim with lots of features, there is a bay to the left and the emergency overflow with overhanging trees. In front of the swim there are several bars located at about 25 yards into the lake and the big island.. The first of the platform swims is right in front of the main island, and offers fishing to the marginal shelves and the deepest part of the lake to the left. Again some of the deepest water lies to the right of this swim some 10ft to 12ft deep. The big island also runs down in front of you with its lily covered bar running down off the end. There is shallow water to the left and right in the margins which produce lots of fish in the warmer months.